Mid-18th Century, porcelain, antique hardware. 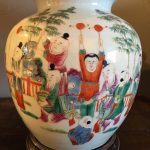 This lamp is a white transparent porcelain glazed vase painted with the “One Hundred Children” theme in famille-rose enamels, and is attributed to Emperor Qianlong period (1735-1796). Strong export trade influenced Qing emperors of the 18th century to develop new softer color palettes that suit European taste and demands. Famille Rose, French for ‘pink family’, was first introduced around the end of the 1720s for use on porcelains. 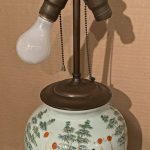 The lamp is unique in the theme selected. The “One Hundred Children” theme started in China where it was a Taoist theme. The ‘one hundred’ and ‘one thousand’ were mystical numbers signifying abundance. This theme went from China to Korea and Japan and became very popular as theme on screens, scrolls, and paintings during the 18th and 19th centuries. A painting of this theme on a transparent porcelain glazed vase, however, is rare. The vase was likely made to be given as a wedding present. The “one Hundred Children” painting was meant to inspire the bride to conceive. At that period, the first duty of a wife to her husband and his family was to bear male children. 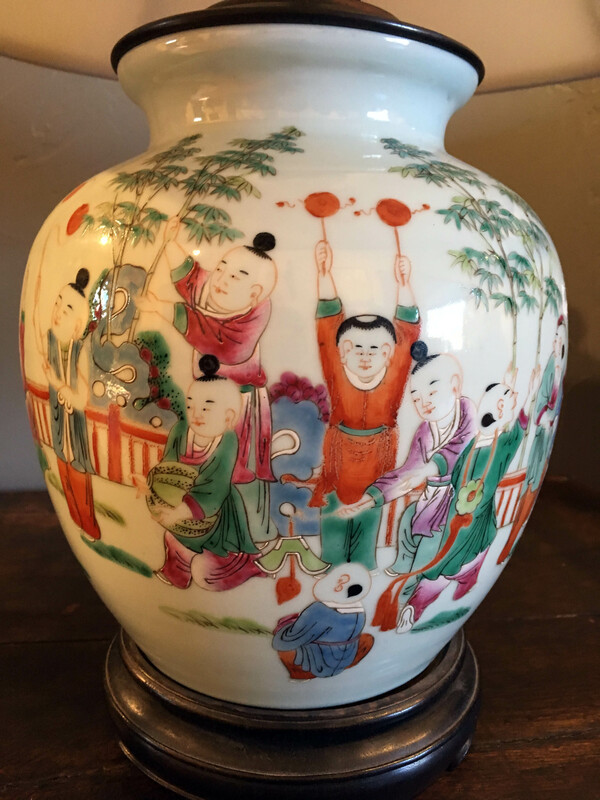 The painting on the vase depicts boys of Chinese court nobility, dressed in Chinese court costumes, engaging in lively games with obvious princely pleasure, in a mansion courtyard showing balustrades, trees, flowers, and exotic rocks. This vase shows the important new technique of application of pigments developed in palace workshops during that early period. Instead of the use of glue to build up thick layers of enamel, rue oil was used here to give thinner and more transparent layers, as can be seen on the leaves and stems of the bamboos. The artist was able to crisply draw the outlines of the animated facial features of the boys, fill in the drawn outlines with soft enamel colors, then highlight each boy’s belt and shoes with thick brush strokes to give a tactile feel. This kind of application shows this vase was executed by an artist of exceptional talent, from a period known for producing beautiful ceramic and porcelain vases. The theme of noble boys and the majestic background clearly means this vase was given to a family of high status. China’s opening to the outside world in the 1980s influenced the foreign community to take interest in Chinese furniture and to acquire beautiful enamelware, converting some of them into household decorative and useful items. 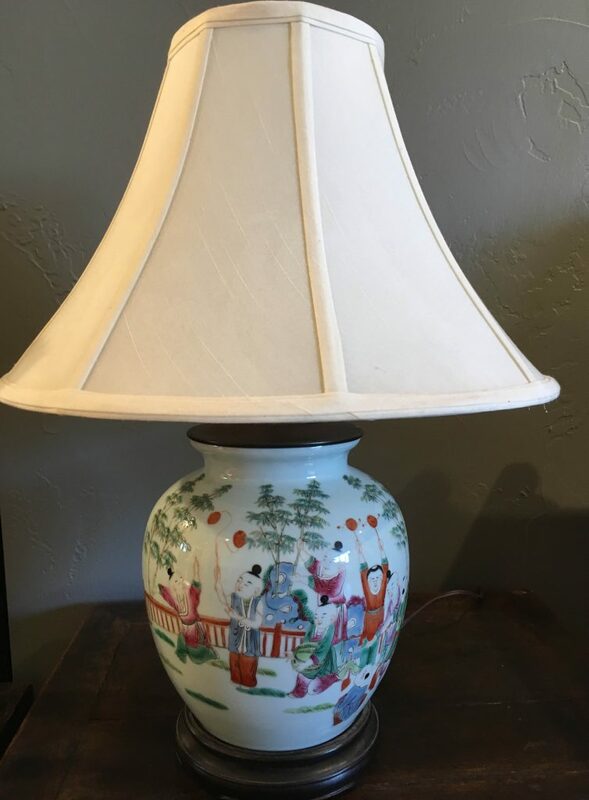 This lamp, with characteristics of a famille-rose vase of Qianlong period and rare painting theme, converted into a lamp with old European bronze hardware, standing on a simple but elegant base of ebony wood, was important enough for a refugee family to take it out of China when the Cultural Revolution started. A white archaic character is ‘penciled’ in at the bottom of the wood base, which might be the attempt of the individual putting the lamp together to reproduce a seal mark originally found at the bottom of the vase. This lamp is not only a utile piece, its rare decorative theme and masterful enameling make it a work of art. The silk shade is not original.